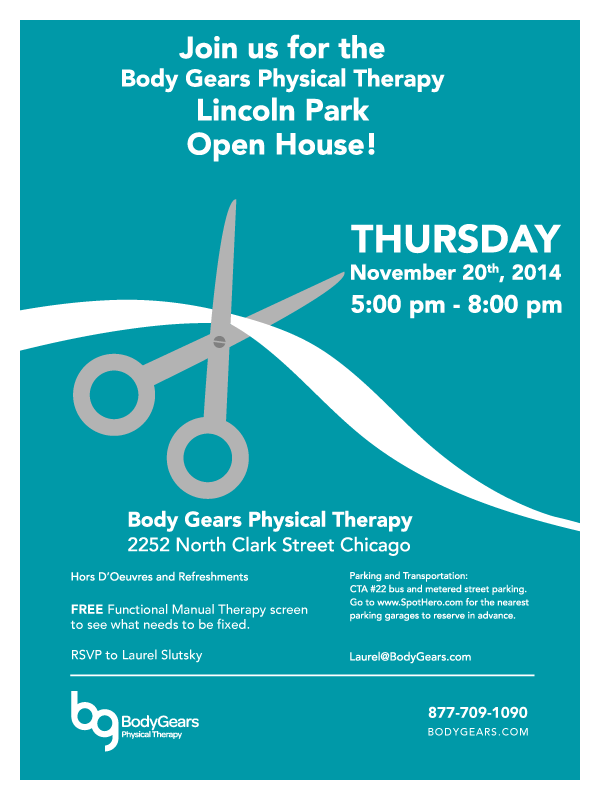 November is officially here and with that comes some exciting events at the Body Gears clinics! Check out the events happening below. We hope to see you there! You’re Invited to Our Open Houses! 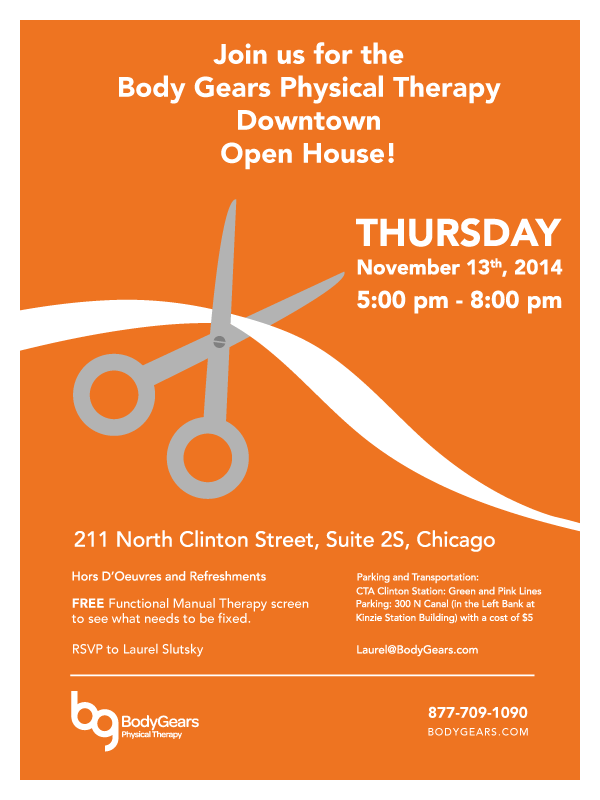 We have two open houses this month, one at our downtown clinic and one at our Lincoln Park clinic. If you live or work in the city, stop on by and sample some of Chicago’s finest grilled meats and veggies while enjoying premium local microbrews! Experiencing any aches or pains? Take advantage and get your FREE Functional Manual Therapy Screen by one of our highly trained Physical Therapists at the Open House! That’s a great question! A Functional Manual Therapy is a type of physical therapy screen that involves a Body Gears Physical Therapist assessing a specific area or region of your body that has been in a state of discomfort or pain. We’re experts at finding the root cause of your symptoms. We like to say that we “connect the dots” of your physical blueprint, taking into account all of your previous injuries, illnesses, and movement issues. In plain English, we watch exactly how you move and determine what’s off about it. Then we put you on the treatment table and our highly trained therapists make adjustments (like releasing a joint that’s too tight, a nerve that doesn’t glide properly, or a superficial fascia on the back that’s not allowing movement). Once we can move the area passively for you, we then teach you how to “drive your machine” (turn on the right muscles) in a new and correct way so that you can move with freedom and ease…and you don’t reinjure yourself. Our treatment philosophy is rooted in the breakthrough practice of Functional Manual Therapy™ taught at the Institute of Physical Art (IPA). Of the more than 300,000 licensed physical therapists in the U.S., less than 300 have a Certification in Functional Manual Therapy™ and fewer than 30 have successfully completed their Fellowship in this modality. To put all of this in perspective, at our treatment center you’ll have the benefit of working with therapists that have risen to the top 1% of their field. Body Gears is the leading provider of FMT in the Midwest. Don’t miss out on any of these amazing events! Grab a friend, come hungry (and thirsty), meet our talented team and let us help you get better!